Downright as formed in 1975 with a mission of integrity and workmanship in the "Old Country" tradition of quality. We offer down pillow, down comforter, baby comforter, blanket, decortive pillow, duvet covers, bedding and wool & cotton mattress pads. Nature’s best – the shell of this comforter combines GOTS Certified organic cotton grown from non-genetically engineered seed and without toxic pesticides and syntheticfertilizers, and TENCEL® lyocell – a natural and renewable fiber made from wood pulpcellulose. Nothing breathes as well as 100% pure cotton, and TENCEL® Lyocell has a silky, sensuous texture and moisture-wicking qualities. This comforter & pillow provides superior comfort and a great night’s sleep to environmentally conscious users. 650+ Hungarian white goose down, 305 thread count, 100% pure organic cotton & Tencel® Lyocell shell, baffle box construction, guaranteed hypoallergenic down filled. Our Merino wool reversible mattress pad, made of 100% pure Australian wool, is a most welcome addition to your bed. This mattress pad is perfect for all seasons. Wool acts as a natural insulator, keeping you warm and comfortable on those winter nights. and, since wool wicksaway moisture, it aids in regulating body temperature, thus keeping you cool in the summer as well. Plus, wool is naturally hypoallergenic and dust/mite resistant. 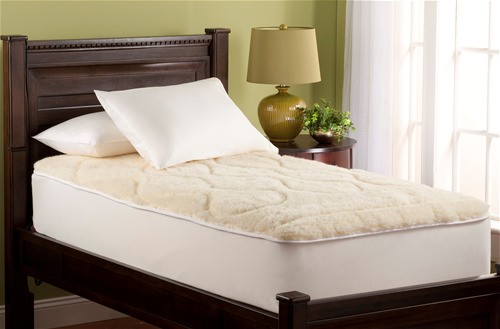 And, unlike most wool mattress pads, our merino wool mattress pad is machine washable too. Available in twin, full, queen, king and cal king with an elasticized skirt that fits up to 20"deep mattress. Himalaya comforter and pillow is handcrafted with the finest raw materials to create a true heirloom that will last for generations. 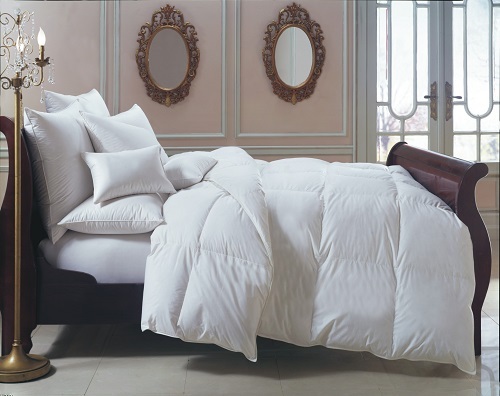 Available in 700 + Polish white goose down or in 800+ Siberian white goose down, 354 thread count, 100% cotton sateen, baffle box construction, guaranteed hypoallergenic down, finest European shell, baffle box construction and guaranteed hypoallergenic down. 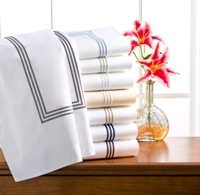 Elegant in its simplicity, clean and simple, the Windsor collection has the ability to blend into almost any decor. 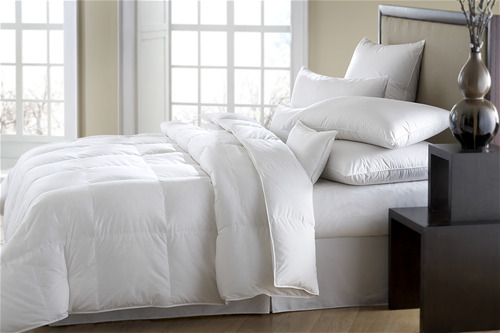 These 400 thread count sateen bed linens are invitingly soft. 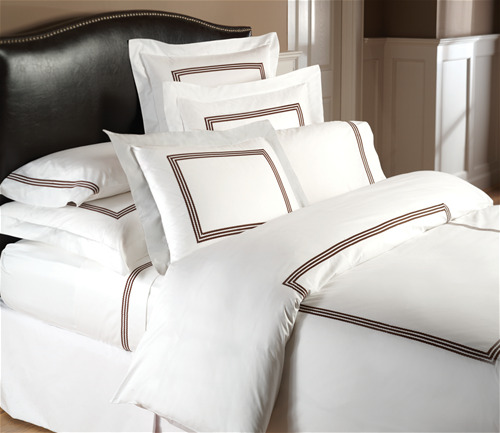 The triple braid design embroidery eloquently complements any bedroom design. Available in white/grey, white/blue, white/sage, white/white, crème/crème, white/taupe, white/navy and white/chocolate. Vilanova is a gorgeous white solid sateen with two elegant rows of applique- borders, this a new timeless contemporary collection for those who love to decorate their bedroom with simplicity and elegance. 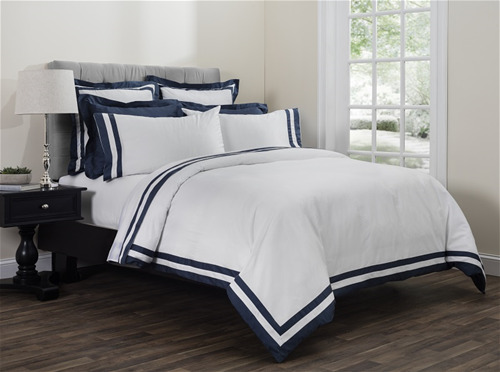 Fitted sheet available in solid Harbor Grey or Hale Navy Pillow shams in double row applique or solid Harbor Grey or Hale Navy. Duvet cover reverses to solid coordinating color.